At least 200,000 people have taken to the streets of the Turkish capital Ankara in a protest against the PM, Recip Tayyip Erdogan. Secularist Turks were demanding the Islamist PM does not run for presidency in the coming election. 'We respect belief, but not radicalism' – a resounding message from tens of thousands of protestors. 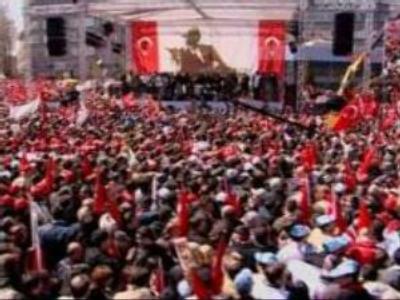 It is the one of the biggest rallies in Turkey's recent history. Although the country is 99% Muslim, it is always kept religion and state separate and a president with an Islamist agenda would certainly threaten that. The founder of the Turkish republic Mustafa Kemal Ataturk implemented reforms in 1923, under which Turkey became a secular, democratic state. Chanting 'Tukrey is secular and will remain secular forever', protesters poured onto the streets with flags and posters of Ataturk. The rally is one of the last chances protestors have to pressure the ruling AK party from nominating Prime Minister Tayyip Erdogan or someone close to him for the post. Holding the majority in parliament, the party can nominate whoever it chooses for the 7-year term. Tayyip Erdogan, however, denies his AK party plans to establish an Islamist agenda and insists it supports democracy. But efforts to remove bans on headscarves in the government and to implement bans on alcoholic beverages have been criticised as doing exactly the opposite. The outgoing President has warned that the country now faces the threat of Islamic fundamentalism at the highest level.